Tabacalera is one of my favourite spots in Madrid, as you can visit it as as tourist, enjoy a concert, view underground art, chill at its big patio, follow one of their workshops, or even bring your children. This space is very lively and always transforming! This building has a long history and quite an influential one for the city of Madrid. It was built in 1790. Its original plan was to be the factory of aguardiente, a traditional Spanish aniseed wine. When Napoleon invaded Spain, the building was used as a factory for cigars, that’s why nowadays it’s called La Tabacalera. The neighbourhood Lavapies was known for having many small tobacco producers. José Bonaparte hired almost 7000 clandestine workers. All workers were women and their uniform influenced greatly the classic image of the “manolas”, the folkloric woman version of Madrid. These women were known for their free & rebellious spirit. They were independent and very passionate. This revolutionary attitude has been inherited by La Tabacalera, since nowadays it’s a very important center for social movements. The building was abandoned for years until it was squatted and now a collective group is responsible for it. La Tabacalera gives birth to life! Every day you enter there are different activities. 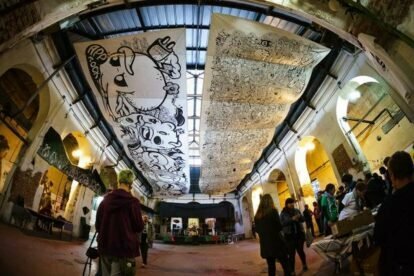 Get lost in their graffiti art tunnels, walk out to their vast patio where you may find artisans creating structures, painting, creating music… attend their open markets and during evenings dance in their central space in one of their many original concerts.